It’s the other “r” word that goes with “rehab” whenever developers of affordable housing try to rehabilitate an occupied multi-unit building. Resident leader Marie Robinson pushed for on site relocation. Too often the rehab goes a lot smoother than the relocation. Forced to move away during the messy reconstruction, some families inevitably decide not to return, or their circumstances change, or some technicality causes them to get lost in the shuffle. In late 2011, when Mercy Housing Lakefront and the National Housing Trust-Enterprise Preservation Corp. purchased the sprawling, long-ago automobile factory, a decision was made early-on to keep virtually all tenant families on site. It was the right thing to do, explained Linda Brace, vice-president for development at Mercy, one of LISC Chicago’s most innovative partners in the development of affordable housing. After all, many tenants had stuck-it-out for three decades, while their Pullman neighborhood on Chicago’s Far Southeast Side witnessed little but disinvestment and discouragement. Nor did they bolt when the investors who previously ran the Section 8 subsidized rent complex skimped on repairs and basic tenant services. So now – with the neighborhood on the upswing, what with a new Walmart opening nearby, with schools strengthening and its historic brick row-houses getting rediscovered by young professionals – now was no time to move out. But how could they stay? How indeed, while Mercy and its contractors ripped out and replaced all the carpeting, patched and painted walls, installed new kitchen cabinets and Energy Star appliances and even added community spaces including a 17-station computer room? Answer: Move to a hotel. Well, not exactly a hotel. Mercy and their general contractor, Madison Construction, began the project by rehabbing and fully furnishing 15 vacant units as hotel-style “suites.” One-by-one tenant families were helped to place their own furniture in storage and move into a suite for the month-or-so it took to redo their apartment. The method is called “rolling rehab” … but the “suites” wrinkle is relatively untested. “They came with every accommodation you would have if you moved into a hotel: beds, dressers, dishes, microwave, cable television, internet … things maybe you don’t have in your own apartment,” remembers former tenant Tomeka Spring. She’s one of 10 residents hired by Mercy Housing and Madison Construction to help with relocation. They did everything from apartment clean-ups to furniture moving. Spring got so good at tracking “punch list” items – minor jobs that required completion before tenants could move back to their units – that Madison subsequently hired her on a permanent basis … whereupon she promptly bought a house in the neighborhood. But many of those who stayed also have uplifting stories. Angela Warren, a tenant for 17 years, also worked for Madison during the relo, first as a housekeeper, then an office assistant, finally doing inspections. Meanwhile her oldest daughter is advancing nicely at Northern Illinois University and she’s putting her newly-honed office skills to work as treasurer of the Pullman Wheelworks Residents’ Organization. “I love it here,” said Warren, whose two younger children still live at home, go to local schools, and make great use of Wheelworks’ computer lab. She’s especially proud of the new playground that she and fellow residents helped build with financial and technical assistance from KaBOOM!, Burger King and the Dr. Pepper-Snapple Group. Finishing the new KaBOOM! playground at Wheelworks this summer. But the best part of the project, according to Marie Robinson, a 32-year Wheelworks plank-owner and president of the Resident’s Organization, was the way Mercy and Madison listened to tenants from the get-go. As with most multiple-unit affordable deals, the most intricate details are those the residents never see. This $28.9 million purchase/rehab transaction drew on 11 separate sources of financing, from tax-exempt bonds sold by the Illinois Housing Development Authority to tax credits bought by the National Affordable Housing Trust; from City loans to state energy grants. And as often happens, the pieces didn’t all come together at exactly the same time. 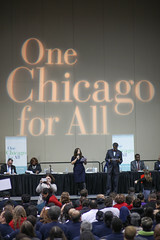 That’s also when LISC Chicago gets most involved. Because key city and other funds weren’t available until well after the proposed sale closing date, LISC with partners JPMorgan Chase, The John D. and Catherine T. MacArthur Foundation and The PrivateBank stepped up with a $2,250,000 “bridge” loan to enable the deal to be finalized – and work to begin – early in 2012. This fall, with work nearly complete, Mercy Housing President Cindy Holler presented LISC Chicago, along with more than a dozen other non-profits and government agencies, with its annual Partners in Innovation Award. Developed in the late 1880s by railcar magnate George Pullman, the self-contained town was to be a model of worker/employer cooperation and efficiency. And it was, for a while, before economic downturns and labor unrest saw it unravel. But enough has survived around which to stage a turnaround: the administration building with its majestic clock tower; the old Hotel Florence; blocks of tidy red brick row-houses; and now, a reborn Wheelworks. It was built in 1903 at 104th Street and Maryland Avenue to house an innovative assembly line for Packard automobiles … then but a faint threat to the glory that was travel by Pullman Palace Railcars. And a lot is happening on the Far South Side, witness this November 2012 story. The area is reviving thanks to partnerships and innovations … not to mention bridge loans and relocation suites.